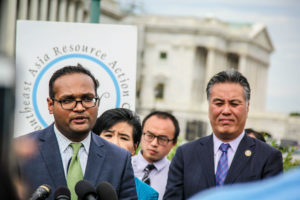 South Asian Americans Leading Together (SAALT) is a national, nonpartisan, non-profit organization that fights for racial justice and advocates for the civil rights of all South Asians in the United States. Our ultimate vision is dignity and full inclusion for all. September 11, 2017 marked the 16 year anniversary of 9/11, and hate violence against those who identify or are perceived as Muslim, Sikh, South Asian, Arab, Middle Eastern, and Asian continues to rise. While the campaign and election of Donald Trump is heralded as the impetus for the growing hate speech and violence nationally, Islamophobia, anti-Blackness, and anti-immigrant sentiment had become normalized and institutionalized in the U.S. over the last sixteen years: from profiling by TSA to police brutality to excessive delays in processing of immigration applications. Trump as well as others would not have been able to advocate and sanction white supremacy so deftly had it not been for the continued embedding of these principles in the foundations of U.S. governance. 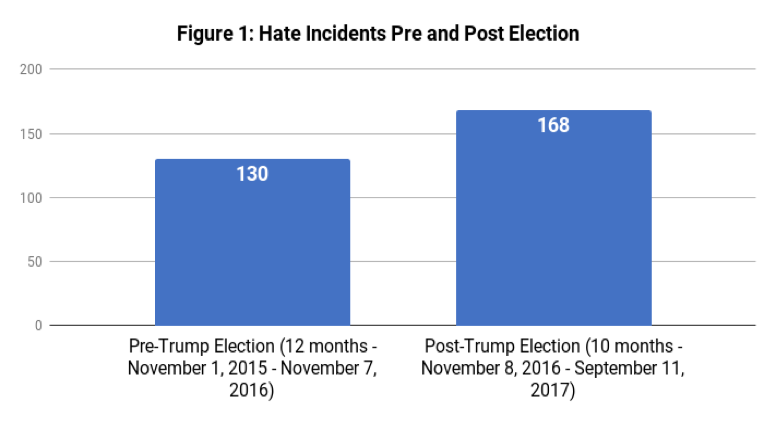 The latest numbers in hate show that in the ten months since the election, a total of 168 incidents of hate have occurred against those who identify or are perceived to be Muslim or immigrant. Figure 1 illustrates that the percent increase is up by 29% as compared to the year prior to the election which had a total of 130 incidents. There is a persistent increase in all categories of hate violence as shown in Figure 2. 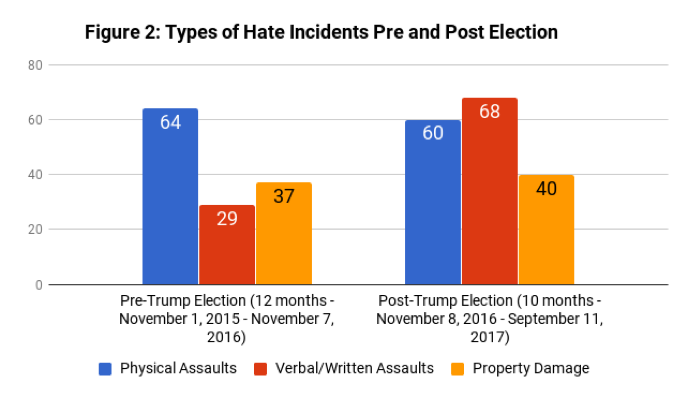 Verbal and written hate speech – at 68 unique incidents and property damage at 40 unique incidents – have surpassed the totals from the prior year. Acts of physical violence, now at 60 incidents, will soon exceed the total of 64 from last year. Recent examples of these hateful acts occurred over the previous week. On September 4th in Ohio, a truck driver fired a gun thirteen times at a Muslim woman in her car. She was struck four times and is currently recovering at a local hospital in Columbus, Ohio. CAIR is urging police to investigate this crime as a hate crime. Then on September 6, a Sikh Temple in Hollywood, CA was vandalized with hate speech. The words, “Nuke all Sikhs,” was scrawled on the walls of the temple. Further, a Filipino-Turkish man was beaten by a white supremacist in a parking lot in Fullerton, CA on September 7th. 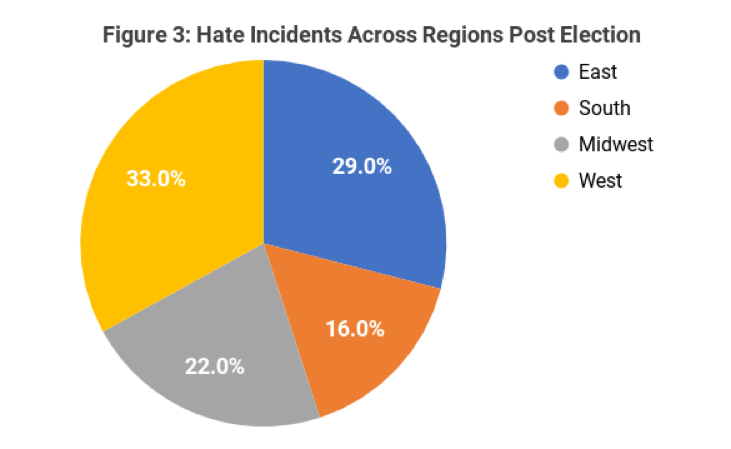 Figure 3 demonstrates that the rise in the number of hate incidents are regionally relevant. The West Coast continues to lead in hate incidents with a third of incidents occurring in that region of the U.S. The hate violence occurring in the Eastern and Midwestern regions make up about half of all incidents. Southern regions of the U.S. have the lowest number of incidents making up 16% of the total. The higher proportion of documented hate crimes in certain regions is due to a variety of issues: 1) a higher proportion of the population that is of color and immigrant, 2) an ease and access to reporting structures, 3) the visibility of the crime, and 4) the visibility of the victim. 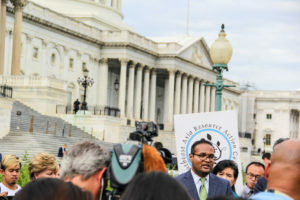 On September 12, 2017, one day after the 16th anniversary of the tragic attacks of September 11, South Asian Americans Leading Together (SAALT), a national civil rights and racial justice organization, held a Congressional briefing to address the rising tide of hate violence aimed at South Asian, Muslim, Sikh, Hindu, Arab, and Middle Eastern Americans under the current administration. 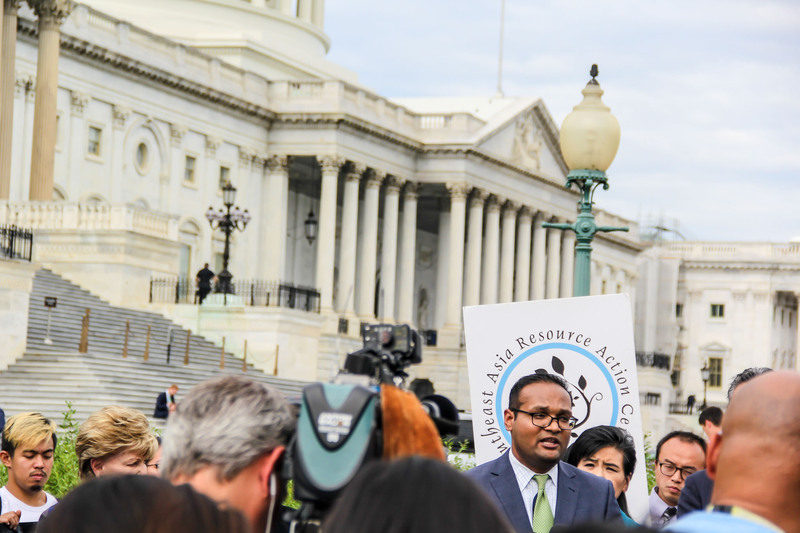 SAALT was joined by five members of Congressional leadership and national partner organizations to denounce this administration’s anti-Muslim, anti-immigrant policies that embolden hate against our communities. The current administration has been fundamental to the growth and audacity of white supremacist and Islamophobic movements in the United States. 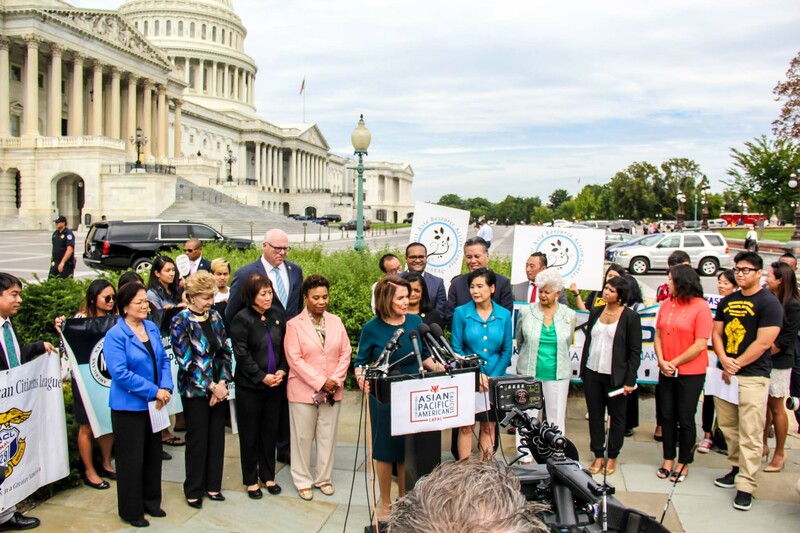 The White House has unleashed numerous divisive policies that have awoken and emboldened hate against our communities, including several permutations of the “Muslim Ban,” rescinding Deferred Action for Childhood Arrivals (DACA), and supporting the RAISE Act, among others. 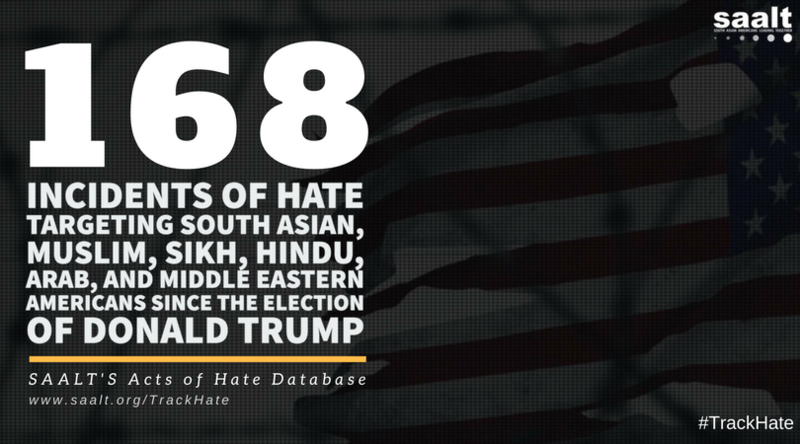 Since the election, SAALT has documented over 150 incidents of hate violence against those who identify or are perceived as Muslim, Sikh, Hindu, South Asian, Middle Eastern, or Arab American, already surpassing totals from the year leading up to the 2016 election. According to the Southern Poverty Law Center, anti-Muslim hate groups grew by 197% in 2016, and, according to the FBI, anti-Muslim hate crimes increased by 67% in 2015. South Asian Americans Leading Together (SAALT), a national civil rights and racial justice organization, fully supports calls by Rep. Nancy Pelosi, Rep. Judy Chu, and other members of Congressional leadership for the immediate passage of the DREAM Act. These demands come on the heels of last week’s decision by the Trump administration to terminate the Deferred Action for Childhood Arrivals (DACA) program, the latest in this administration’s anti-immigrant policies that puts 800,000 people at risk of deportation from the only country they’ve ever called home. Over 27,000 Asian Americans, including 5,500 Indians and Pakistanis, have already received DACA. An additional estimated 17,000 individuals from India and 6,000 Pakistan respectively are eligible for DACA, placing India in the top ten countries for DACA eligibility. With the termination of DACA, these individuals could face deportation at the discretion of the administration. Our immigration laws are badly broken – disregarding our values is not the answer to fixing them. We call on Congress to do its job and immediately pass a clean DREAM Act that creates a roadmap to citizenship for aspiring new Americans. This is the only way to align our immigration laws with the values Americans hold dear. Washington – Civil rights leaders, faith based, human rights, and community organizations condemn today’s bigoted, anti-Muslim online campaign by ACT for America, reportedly the nation’s largest anti-Muslim hate group. 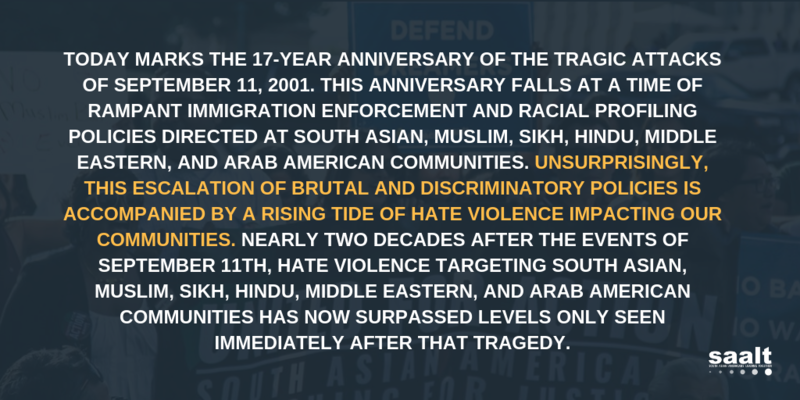 This online campaign was scheduled for just two days before the anniversary of September 11 to target and manufacture hatred for American Muslims at a time when violence against Muslim, Arab, South Asian, and Sikh communities is reaching historic highs. ACT originally planned to coordinate 67 anti-Muslim rallies across 36 states under the theme “America First.” However, after thousands of Americans came out in peaceful resistance to white supremacy and racism in Charlottesville and Boston, ACT decided to call off its rallies and shift to today’s online campaign, a clear signal that messages of justice and solidarity are drowning out messages of hate nationwide. 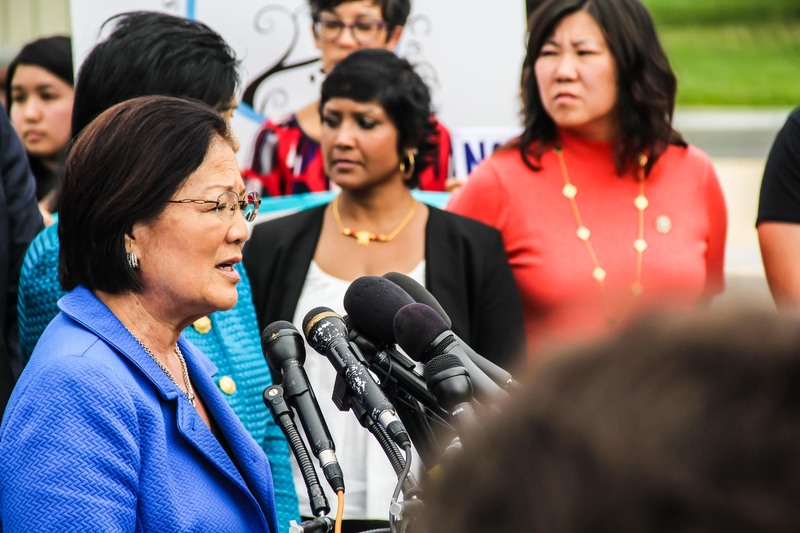 This is not the first time civil rights groups and anti-racist protestors stared down ACT’s bigotry. In June ACT held anti-Muslim rallies in 30 cities across the nation under the theme “March Against Shariah”. This campaign was met with strong resistance from civil rights groups who held alternative events that telegraphed calls for love, fairness, and justice. The Trump administration was silent in response. ACT’s founder, Brigitte Gabriel, has made her racism clear. She has said, “Every practicing Muslim is a radical Muslim” and has argued, outrageously, that Muslims are a “natural threat to civilized people of the world, particularly Western society.” In a video message launching the America First rallies, Ms. Gabriel exclaims, “Let’s show our president that we are behind him in securing our nation.” In accordance with the bigotry that ACT promotes, its previous anti-Muslim rallies have attracted a host of armed militia-type groups and white nationalists. Likewise, President Trump has made no secret of his bigotry,, stating on the record, “I think Islam hates us” and moving forward with his administration’s dogged pursuit of a “Muslim Ban,” among other policies. The words and actions of the administration, including high-level advisors who are known standard-bearers for white supremacist movements, as well as the President himself, increasingly fuel and validate violence targeting Muslims and people perceived as Muslim. The FBI’s 2015 hate crimes statistics, the most updated data available, show a 67% increase in hate crimes against Muslims in 2015, while violence aimed at South Asian, Sikh, and Arab communities continue to rise. The xenophobic statements by the President and Gabriel run counter to the values of justice and inclusivity that we seek to uphold. 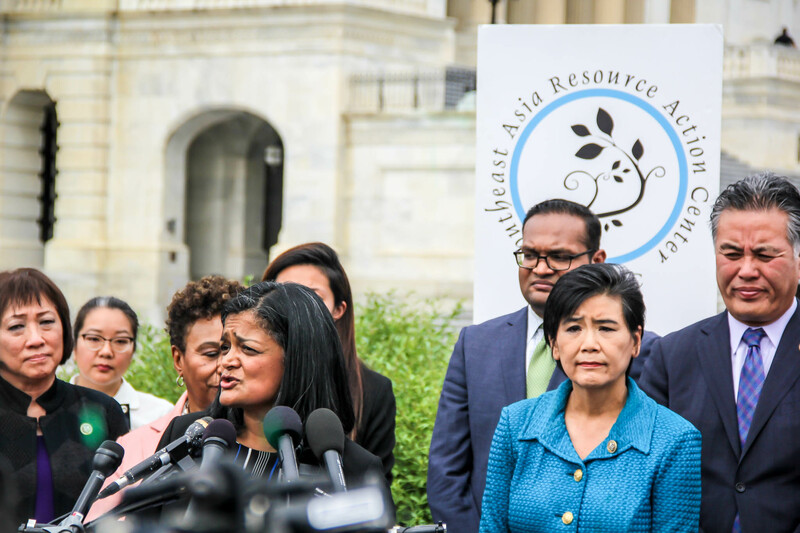 Peaceful resistance by civil rights groups, immigrant and faith communities, and communities of color has been the strongest counterweight to the insults and injuries of white supremacists and this administration. We demand this administration, and all elected and appointed officials, condemn groups that peddle hate in the strongest possible terms, and back that condemnation with swift action and policies that contribute to the transformation of our institutions. The hatred must stop now. 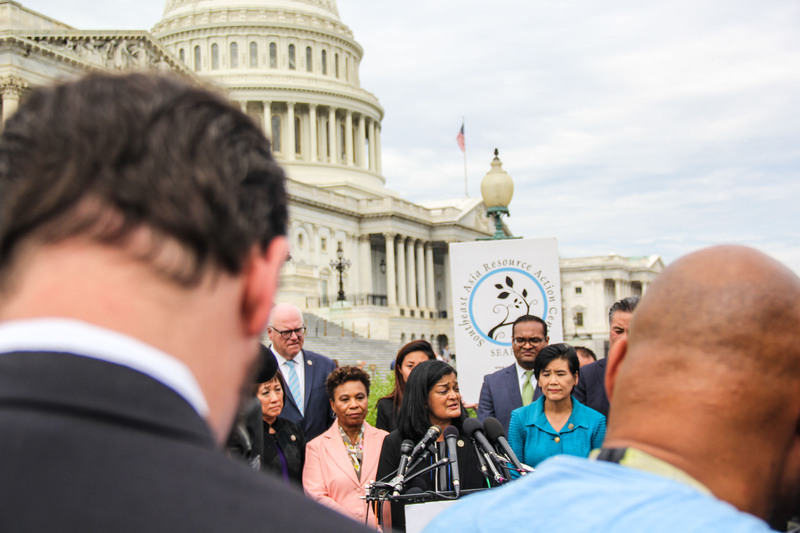 As a coalition of diverse organizations representing communities of color and immigrants at the national, state, and local levels, we are committed to condemning bigotry of all kinds and advancing the principles of racial justice. The Trump administration will phase out DACA after a six-month delay, punting responsibility to Congress to craft legislation to protect Dreamers. 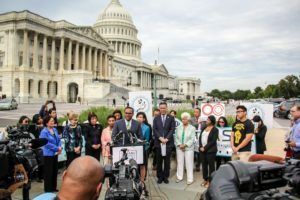 Passing the DREAM Act 2017 is an important first step, but what the nation needs is comprehensive immigration reform. The CEOs of Apple, Google and Facebook and many other business leaders have all staunchly supported DACA and opposed its termination, citing their need for talented workers in a direct rebuttal to claims that DACA has hurt the American economy. When asked about DACA in February the President stated, “We are going to deal with DACA with heart.” Yet today the Attorney General called the termination of DACA a compassionate decision, revealing how tone deaf and inconsistent this administration is to its past statements and American values. The administration has announced several permutations of the “Muslim Ban”; continually called for the construction of a wall on the southern border of the United States; has rolled back Deferred Action for Parents of Americans and Lawful Permanent Residents (DAPA); supported the RAISE Act that seeks to slash immigration in half within a decade; and encouraged, endorsed, and emboldened bigotry, white supremacy, and hatred toward immigrants, Muslims, and people of color across the nation. That is not the type of ‘heart’ this nation needs. Since its inception, this administration has demonstrated a crucial lack of heart, compassion, values, and respect for the law when it comes to DACA and immigration. It is time for Congress to step up and pass comprehensive immigration reform, and for all elected and appointed officials to defend our communities through words and actions. We are here to stay, we have the same rights to America as anyone else, and we are not going away.